Writer/Director Jeff Nichols does a really good job of creating an authentic blend of mystery, drama and sci-fi. Nichols develops the story in such a way that the movie almost feels like an actual novel. Every scene reveals just enough and every new scene almost feels like you've just turned the page. One of the interesting aspects of this film is how the mystery of the little boy challenges a lot of popular thinking. We have no idea if he's an alien, religious savior, or a superhero from a comic book. Regardless of who or what the boy is, the film keeps you in a state of wonderment as it develops over time. From the very beginning, Michael Shannon is great in his role as "Roy". As the boy's father, he portrays an interesting balance of confliction, love, and dedication when it comes to his son. At times, it's hard to tell if Shannon's character is just some religious zealot or if he's just sincerely concerned for his son's well-being. Joel Edgerton (plays "Lucas"), also delivers an interesting supporting role as his character seems to be on the fence about his beliefs throughout the film. I suppose one thing that may not resonate with some people is that, while this is a mystery, it doesn't really answer all of your questions. If you miss a few subtle lines here or there, by the time you get to the end of the film, you may feel as though there were some plot holes. The director purposely left some things up for interpretation, but that doesn't necessarily mean that people will be okay with that. I think that one of the best ways to approach this film is to just dive right into it. Don't read about it, and if you haven't already, don't bother watching any trailers. I think that if you also go in with low expectations, you may actually enjoy the movie a bit more as well. It's one of those movies that will keep you guessing, and it will also deliver a few surprises here and there. This film is a bit of an original however you'll probably notice a lot of similarities from other movies like ET, Super 8, or Knowing. I thought that the film was good overall, and if you want something a little different, then give this a chance. Sci-Fi fans should really enjoy this, especially if you happen to watch it at home. Buying your ticket here makes a small contribution to this page. 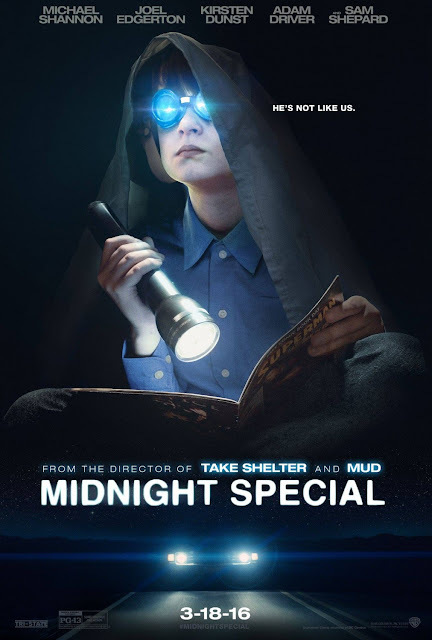 I had the pleasure of being able to attend the Chicago screening of Midnight Special, and we were lucky enough to have Jeff Nichols and Joel Edgerton stop by. They talked about the film and gave some interesting insight about the film. Be sure to check it out.